The Halle Backdrop is a take on our grecian backdrop with more structured edges. Ideal for birthday parties or weddings.We up-lit the stage using our lighting and this can be customised to match your room decor and theme. The lighting makes the backdrop dramatic and gorgeous. The Halle Backdrop is one of our newer styles of backdrop structured and beautifully lit. Wedding backdrop with structured gathers. The stunning Eva Backdrop is a perfect compliment to your big day. Position behind the top table and frame the perfect scene for your guests and your big day. Elegantly beautiful and available for hire. This backdrop is for those that want extra lights, extra drama, extra atmosphere and extra fun. 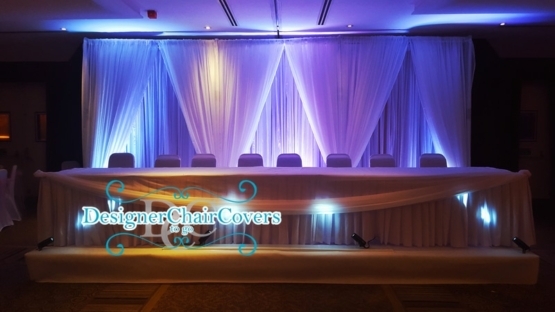 Compared to our standard backdrop this range has an abundance of light ideal for the top table at weddings or events. With the Designer Twinkle Starlight Backdrop the main focus is most certainly the bride and groom only- The free standing backdrop becomes perfect place for photographs the first dance and completely transforming a room. Find out how the Designer Twinkle Light Backdrop can help transform your big day. This Twinkle starlight backdrop comes loaded with a plethora of lighting which can work to really transform the room and day and be a great atmosphere for when the evening party starts. The crystal backdrop is a new creation mixing our crystals and the starlight backdrop. 1000s of crystals aligned along the entire backdrop with lights and is certainly a dramatic centrepiece when your guests enter the room. Entrance draping is a great way to transform a doorway from bland to exciting, the fully customisable draping makes it the perfect way to incorporate into your wedding theme from the simple white to other colours. Our draping can come with or without lighting depending on your requirements. 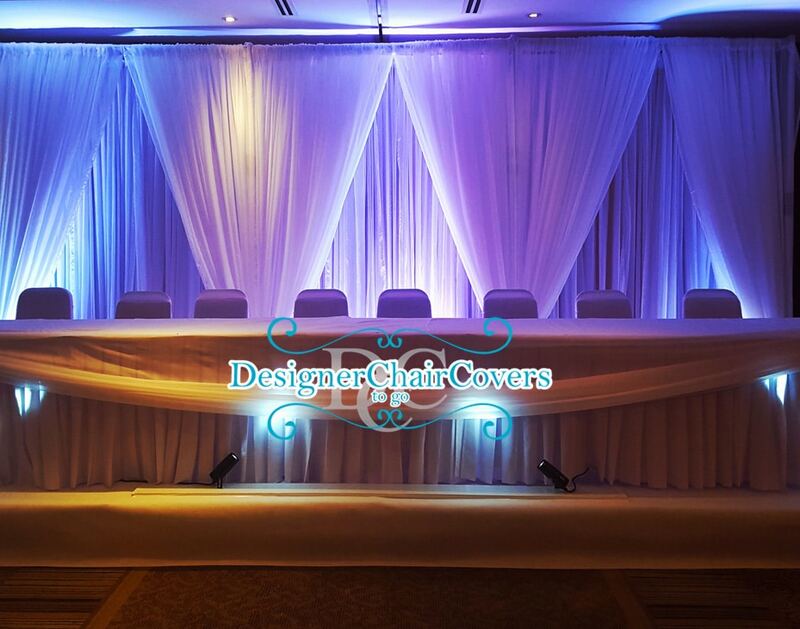 The free standing systems mean we can place our draping almost anywhere to create a beautiful walkway for your wedding or event. Get in touch for more information. The gold mirror backdrop stage design. The gold mirror can be customised with silver mirror or the flower wall design can be changed also. Do let us know your thoughts we can adjust EVERYTHING!